Is there an upgraded guide flag available for the older Scalextric push in guide? Scott, I'm not sure whether the B-Nova guide would work on that car, but may be worth checking out. You mean to you want to replace the older non-guide plate aka quick change guide? I use a Slot.it CH10 guide or a CH07 guide that has been trimmed. The nose of the car doesn't have room for a B-Nova. (At least I an not going to cut the car up to find out.) And I have modded up a Slotting Plus guide to fit where the Scaley Quick Change guide came out. However, the guide does have slop that I don't care for. Rich, do you have any pictures of your installation you could share? Scott, I found this thread from a while back; may be useful. There is not much to see, but here you go. The guides that I mentioned are held in with a screw and washer. The screw is tightened down to eliminate any wobble, but still allow the guide to swivel freely. I like to use the over sized eyelets from Professor Motor, those are not likely to pull out. Bottom picture so you can see what I am dealing with. Just no room for a B-Nova unless I cut the nose off the chassis and glue it to the B-Nova. But I have come up with a work around. I modded a Slotting Plus guide to mimic the Scaley quick change guide. The braid is wrapped around the guide but it is held in with a screw. I had a problem with the shaft diameters being different, the Slotting Plus guide was loose in the pivot hole. 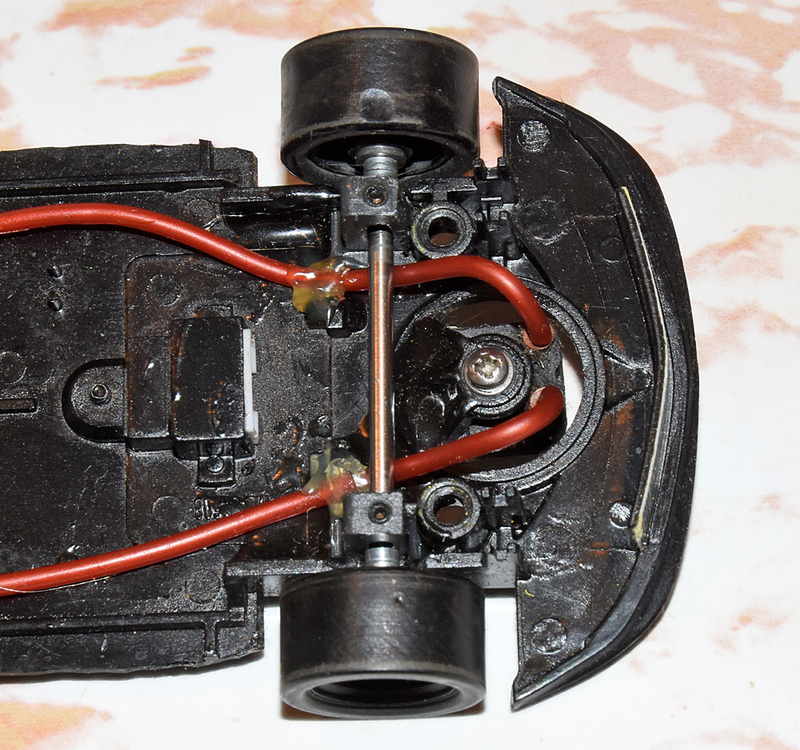 I did not have a plan for this problem and had run of ideas... Until I was working on an HO car body. I was making window glass for a resin Gremlin I had and at the time I was thinking "This clear plastic is really thin." Light bulb.... Small section of thin clear plastic is used to shim guide. And done.